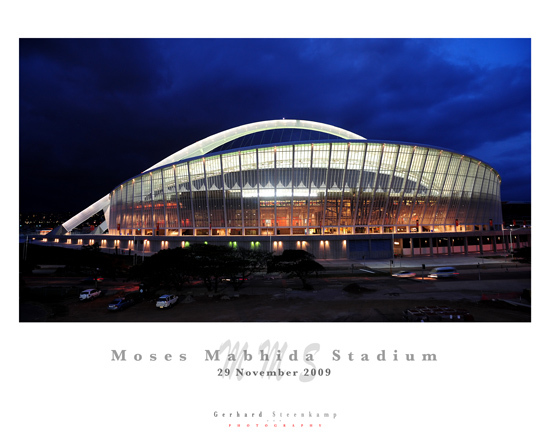 It is 28 November 2009, a day before the opening match at the Moses Mabhida Stadium in Durban. I’m at the Kingspark Swimming pool across the street busy with the Westville sprints gala. Just finished taken photos for the day at 6:30 pm and went out to get some fresh air. See the light outside, rush back inside, grab my D3, 24-70mm, 20mm and 10.4mm lenses. Ran to the outside pavilion to the top and took around thirty images with the three lenses for about 10 minutes. Normally stadium lights and ambient light balances out for only 10 minutes or so. So to get the right balance one must be quick and be at the right time at the right place. Tomorrow at 3:30pm is the opening match between Amazulu and Maritzburg united. All the tickets are sold out which mean there will be more than 70 000 people in the stadium. I’m going to cover the game and looking forward to see the stadium from the inside for the first time. One of the 2010 World Cup Semi Finals will be hosted at the stadium. Hope i will have the priviledge to attend that match as well. Here one of the images i took with the Nikon 20mm F2.8 lens. Just want to mention that i have been to the match yesterday and there were only 20 000 people. they said that the tickets were sold out but they only put 20 000 tickets available for the opening match. Apart from that it was a great experience. Bliksem, wat n stadion !!!!! Of is dit die foto wat so mooi is ?? weereens ‘n great shot! geniet altyd die kombinasie van die die 2 ‘ligbronne’.